This weekend in Foxboro, Mass., more than 100,000 spectators are expected to pour into Gillette Stadium to see four schools -- Duke, Virginia, Cornell and Syracuse -- square off for the national championship of a sport that, if the numbers are correct, you'll be hearing a lot more about. That sport is lacrosse. Until recently, lacrosse -- America's other stick and ball sport -- was rarely on TV and only its championship games generated much in the way of media coverage. It was mostly played on the East Coast, and it was often viewed as a game for private-school kids. Some of the game's most electrifying athletes -- Gary and Paul Gait; Casey, Ryan and Michael Powell -- were little known outside core followers. The sole exception may be Jim Brown, the former Cleveland Browns running back who played lacrosse at Syracuse University. Economics reporter Kelly Evans explains how lacrosse has grown in the last 10 years among American students from many demographics. "Lacrosse has taken off because it combines the hitting of football, the speed of basketball, and requires the endurance of soccer," says Kyle Harrison, who led Johns Hopkins to a national championship in 2005 and who won that year's Tewaaraton Trophy as the country's best male player. These days the sport is showing serious growth. 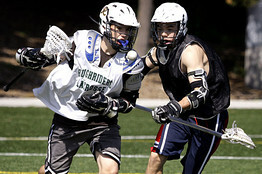 Participation in high school lacrosse has about doubled this decade, to a total of 143,946 boys and girls playing on high school lacrosse teams in the 2007-08 school year, according to the National Federation of State High School Associations, which tracks participation by sport. In 2000-01, there were 74,225 high school lacrosse players. And the fervor goes beyond high schools. A 2007 survey by the National Sporting Goods Association found an estimated 1.2 million Americans over age 7 had played lacrosse within the previous year -- an increase of 40% since 1999. Johns Hopkins is one of the 56 men's Division 1 college lacrosse teams, based on NCAA data from the 2007-08 season. Including Divisions II and III, there are some 239 men's college lacrosse teams nationwide with 8,900 athletes, double the number of participants two decades ago. On the women's side, there are now more than 300 college lacrosse programs across Division I, II and III, according to the NCAA, triple the number seen two decades ago. It's also growing when compared to other sports. In the 2007-08 school year, 17 colleges added women's lacrosse, more than any other sport. Meanwhile, a dozen men's teams were added in 2007-08, far more than sports like basketball, which added three teams; football, which added two and baseball, which added just one team. Lacrosse 101: A beginner's guide to North America's oldest team sport. Lacrosse is a fast-paced running and shooting game created by American Indians. Migrating south from Canada in the 19th century, it won followers in the Northeast; New York University fielded the first college team in 1877. The men's game has 10 players who wear helmets, shoulder pads, elbow pads and gloves. There's body contact and stick checking, with the most effective shooters able to weave and dodge around defensemen. The women's game has 12 players who wear protective eye goggles and sometimes gloves. There is no body contact, so the focus is on passing, cutting and running. A number of factors have contributed to the sport's growth, including an increase in media coverage, the availability of athletic scholarships and the sport's growing appeal at schools west of the Mississippi. "The game has just exploded in the three years that I've lived in San Diego," says Dave Herman, the varsity boys' lacrosse coach at Francis Parker School in San Diego. The availability of college scholarships is also a draw. Chuck Cohen, who helped launch a youth league in Orangetown, N.Y., that has grown from 70 boys in grades five through eight to more than 300 boys and girls from first to eighth grades, says, "Many of the D-1 teams are offering college scholarships, and there are tournaments and recruiting camps where college coaches can watch the kids play." The Web has played a crucial role, says Steve Stenersen, CEO of US Lacrosse, the sport's governing body. "There's tons of stuff on YouTube, as well as coverage on a variety of news and alternative sites." The media, specifically cable TV networks such as ESPN, have also popularized the sport. "It's always been considered an Eastern sport, but now it's spreading nationwide," says Steve Herbst, executive vice president of CBS College Sports Network, which has carried the sport for six years. Lacrosse has been welcoming to women. Forty years ago, there wasn't a single girls high school lacrosse team; in the 2007-08 school year, there were over 1,600 high school programs with more than 60,000 players in 23 states. Undoubtedly, many will be watching Northwestern University, based in Evanston, Ill., compete this weekend for its fifth consecutive national women's championship. As might be expected, the states with the most popular programs are those where the sport has traditionally been popular. New York has the most, followed by New Jersey, Massachusetts, Pennsylvania and Maryland. But next on the list is California, with 110 high school teams and over 3,000 women's lacrosse players. 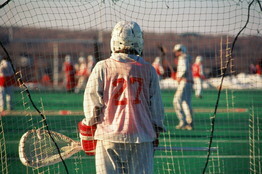 High-school lacrosse players practice in Seattle. Lacrosse still trails far behind more traditional sports and it remains to be seen whether the sport will ever catch up in popularity. The number of high school lacrosse players, at about 144,000, is just a fraction of the participation seen in football, with 1.1 million high school athletes; basketball and track and field, both with just over a million players, and soccer, with 730,000, as of the 2007-08 school year. The economy has also had an impact on the sport. Jake Steinfeld, founder of Major League Lacrosse, a professional outdoor lacrosse league that kicked off its ninth season last weekend, says the MLL now counts six teams, down from 10 in 2008. "This is like any other business, you try to understand what's happening with the country and the economy," he said. "Our goal is to stay alive and thrive." Virginia's Max Pomper, right, looks to make a play against Johns Hopkins' Mark Goodrich. The recession has been felt elsewhere. "We'd hoped to have 50 stores by 2019, now those plans are derailed," says Joe DeSimone, co-owner of Lacrosse Unlimited Inc., based Hauppauge, N.Y., which owns 19 stores in the Northeast. Mr. DeSimone says he generated about $250,000 from his first store in 1990; this year he expects revenue to top $15 million. "Our average sale was probably less than $50 in 1990, today it's probably $110." Still, fans say the changes are striking. "The three areas that are really booming right now are high school women's, youth boys and youth girls," says Paul Gait, a Syracuse University Hall of Fame lacrosse player who's now president of Albany, N.Y.-based DeBeer Lacrosse, one of the four major equipment makers. But that doesn't necessarily mean business is booming: differences in how the women's and youth games are played means those players tend to spend less on equipment. "For years we were seeing revenue growth of ten percent but now it's more like 5-6% and decreasing each year," Mr. Gait said. "People like me live by the growth of the sport and none of us are getting rich," he said. High school girls' lacrosse teams were not officially sanctioned by state athletic associations 40 years ago. This story incorrectly stated there were no high school girls' lacrosse teams 40 years ago.